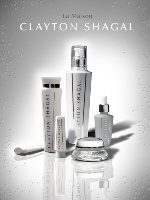 La Maison Clayton Shagal is a Canadian skin care manufacturer, headquartered in Quebec. It began its operation in 1982 with the production of a single product, a collagen gel of high quality. Putting an emphasis on simplicity and efficiency, Clayton Shagal developed its product quality by focusing on an understanding of natural regeneration process of the skin. We have in our jars!